To create a meeting point and connection between potential employees and the company, to fill job vacancies that may exist or be open. To send a newsletter if requested by the interested party. Rights You have the right to receive confirmation if we are processing personal data that concerns you or not. You have the right to access your personal data, as well as to request to amend incorrect data or, if the case may be, request for it to be deleted when, among other reasons, it is no longer necessary to keep the data for the purposes for which they were collected. In certain circumstances you can request for the processing of your data to be limited; in this case we will only keep it for claims processes or advocacy. If the data requested during the process of browsing our web site or if the data provided is incomplete and/or inaccurate, we will not be able to successfully respond to any request which requires specific personal data. Likewise, you can exercise your right to transfer data, as well as withdraw the consent granted at any time. This will not affect the legal processing of data collected prior to the withdrawal of consent. 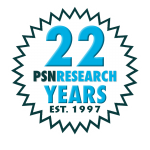 PSNResearch is currently accepting new projects. Please email us at info@psnresearch.com Thank you.